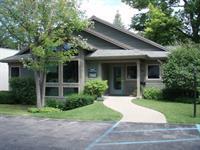 We are located off Davis Street one block East of Northwestern Michigan College across from the Best Western and the Urgent Care. Dr. Mark D. Noss has been practicing in Traverse City for over 35 years and was thrilled when his daughter, Dr. Rebekah Noss Lynch, joined him in practice in 2008. At Full Spectrum Eyecare, our focus is on quality and complete eyecare for your family, provided by our family. We pride ourselves in being a local, family run business and offer a unique, individualized experience that sets us apart. Full Spectrum Eyecare offers both eyeglass and contact lens examinations. We have the latest technology to diagnose and manage ocular conditions like macular degeneration, glaucoma and cataracts. Our optical has many stylish frames to chose from and we always will accommodate a special look or design that our patients may have in mind. If we don't have a frame that you love in our optical, we can order one! We are accepting new patients and would love the opportunity to impress you with our friendly and knowledgeable doctors and staff who treat all our patients with the care and compassion they deserve.